I love the Legends & Lore series. A year ago, I reviewed my favorite EVER book about the flood -- The Flood of Noah: Legends & Lore of Survival. We all loved it, with all the little mini-books and flaps and doors and other such interactive fun. Seeing the newest title in this series, Giants: Legends & Lore of Goliaths by Charles Martin, I knew I had to get my hands on it too. What does the Bible say about giants? Full-color artistry developed in an interactive format with fold outs and flaps, booklets, and more! A spectacular center spread stretching 4-feet across! It is fascinating that the ancient world agreed on many aspects of the Bible, one of these being that early in the history of mankind, a race of violent, yet intelligent giants walked the earth, were destroyed by the Flood. Through historical records, the pre-Flood and post-Flood worlds are reconstructed, with giants re-emerging in and around Israel, and you’ll see one more reason that the Bible can be trusted. David and Goliath, in a huge and massive scene, gives a fun perspective on the shepherd boy vs. the giant. It is just fun to pull that open and look at it. The other pages have more information though. 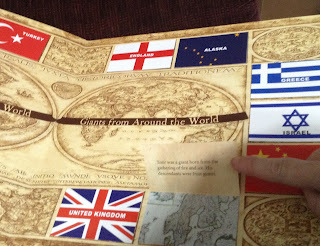 The above page is right as you open the book, with basic info about local giants underneath each of the flags. It is fun to run across some we've heard of, and many we haven't. 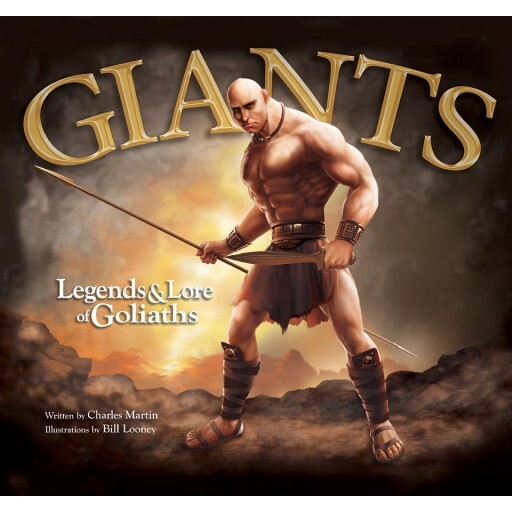 The basic idea of the book is to explore giants, stories and legends of giants, and biblical accounts of giants. What is real? Are the Bible stories really that far-fetched? I enjoy reading through this with my kids, as we can read the main text at one point, and pull up little booklets or flaps at a different time. Tales of giants are everywhere. It was fun to explore them.